“We want a seat at the table as equals,” said Brian Lang, president of Unite Here Local 26. After 30 years of scrubbing toilets on her hands and knees at the Sheraton Boston Hotel, Mei Leung’s knees are permanently black with bruises. Leung, 71, can’t afford to retire, in part because she needs the money to pay for her husband’s prescriptions, and has resigned herself to the physical toll that housekeeping takes. “Pain comes with the job,” she said. But Leung isn’t resigned to doing nothing. On Wednesday, Leung will join hundreds of other hotel workers picketing at seven Boston hotels run by Marriott International — the largest hotel operator in the city, and, following its purchase of Starwood, in the world — to draw attention to union contract negotiations with 31 hotels around the city. Marriott workers in San Francisco, Honolulu, Seattle, Philadelphia, and other cities will also be holding actions that day. 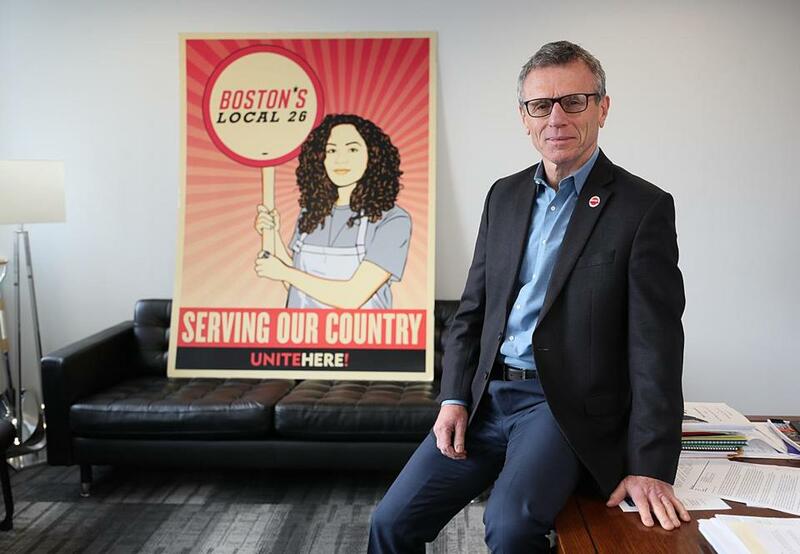 The union, Unite Here Local 26, is looking for a more collaborative role in protecting its members as the industry undergoes major changes, said president Brian Lang. With hotels now largely owned by real estate investment trusts or private equity companies, the pressure to keep labor costs down — and profits up — is more intense than ever, Lang said. Technology is also poised to transform hotel work, with self-check-in kiosks, robot room-service delivery, and mechanical bartenders all either a reality or a possibility, Lang said, and the union wants a voice in how these changes will be addressed. Local 26 could create a training program to teach workers how to operate this technology, he said, or help develop a buyout program to shed unnecessary workers. The union could also play a hand in developing technology that would benefit both hotel guests and workers, such as a tipping app for people who no longer carry cash. “We want a seat at the table as equals,” Lang said. Local 26 is also calling on hotels to protect worker hours, provide more secure schedules, and improve sexual harassment protections and pregnancy accommodations.